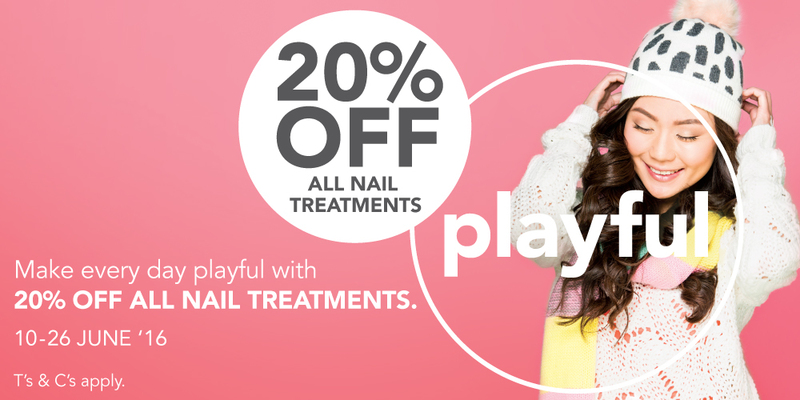 Get Playful with 20% off all nails this Winter! This winter we’re saying Go! Go play. Go laugh. Go explore. Go have a good time. Go smile. Go Happy. Go relax. Go get that feeling. In the midst of our daily grind and the bombardment of choices we’re made to make at home, in the office, online, choosing our nail polish can simply just be fun! With the celebration of Youth Day in mind, we think it’s high time to lose the serious and get with the glowgramme of nail playtime. Take a step away from the ordinary. Experiment with some colour and let your nails come out and play. How about a pastel or white nail with a pop of metallic, bright or neon colour on the tips? You can play around with designs, too: try a chevron tip, asymmetrical or even a row of dots; chrome, duo-chrome, nail wraps or painted designs. When it comes to nail fashion, anything fits and the possibilities are endless. This Winter, we’re giving you every excuse to have some fun and let our inner child, diva, goddess and queen come out to play – with 20% off all nails 10 -26 June 2016! So go on, pop it like it’s hot and get a little #playful! Nails include all Mani’s, Pedi’s, Gelish, Bio Sculpture, Acrylics, Tips, Soak Offs and Nail Art. Click here for a full list of nail treatments.